I wanted to submit a quick story about our adoption of Marley through Fetch A Cure/Pixie’s Pen Pals. It was 4 years ago today that my husband & I brought Marley home. The past 4 years have been the best four years and a lot has to do with bringing Marley into our family. We could not imagine our lives without him. The adoption process was a very easy, smooth process and Marley has truly completed our family. We get compliments on how well behaved Marley is and how we are so lucky to have such a great dog; and we couldn’t agree more!! 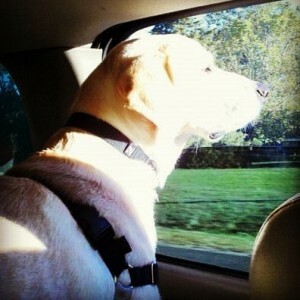 The picture included in this story is Marley’s first car ride with us on his way over to his new home. We are so thankful to Fetch A Cure and Pixie’s Pen Pals for allowing us to find Marley and bring him in to our family.